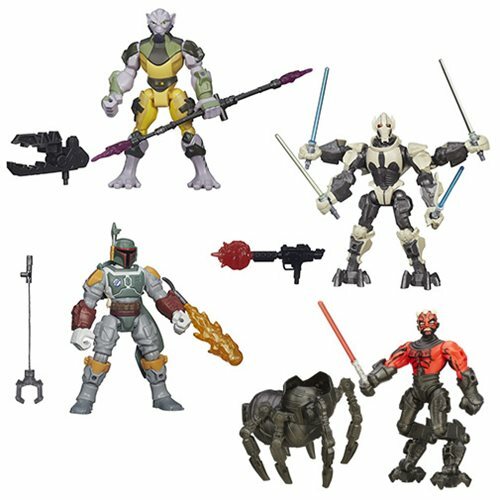 Tear apart the galaxy with the Star Wars Hero Mashers Deluxe Action Figures! Build Darth Vader and his Imperial forces, Rebel heroes, or new freakish creations of your own design. Each articulated action figure has removable limbs and can be dismantled and reassembled - you can swap pieces with the other figures in this set and make your own customized creations! Each figure has a cool accessory like lightning, lightsabers, blasters, and more allowing you to customize your toys your way. Star Wars Action figures measure up to 7-inches long. Ages 4 and up.